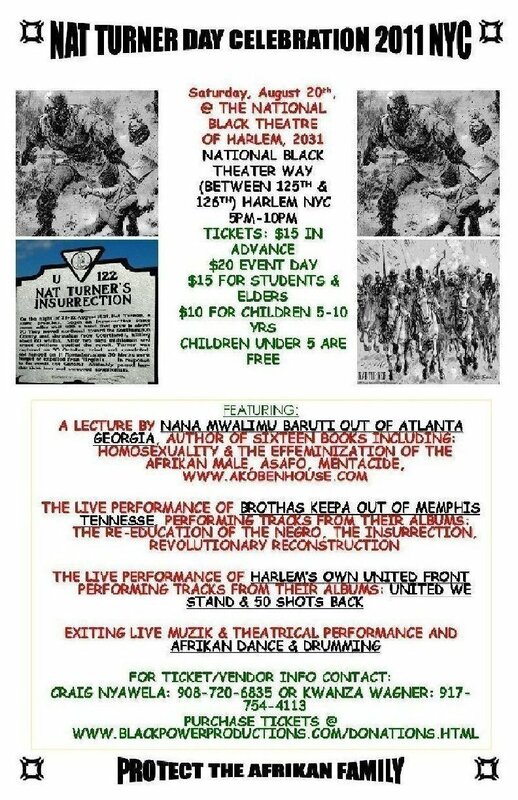 Saturday, August 20th: 2011 NYC "Nat Turner Day Celebration"
Goto http://theblacklistpub.ning.com for more announcements. 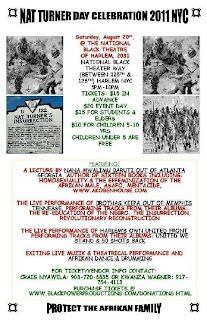 HARLEM WILL RALLY FOR LIBYA! On Saturday, August 13th, the New Black Panther Party will be front and center in Harlem for the Millions March (for Africa) in Harlem! 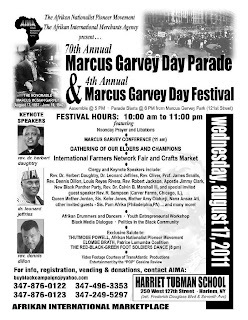 An event sure to garner international attention, this march and rally will feature a who’s who in the area’s PanAfrikan community. Among the noted participants include Councilman Charles Barron, prolific PanAfrikan scholar Molefi Asante, Viola Plummer of the December 12th Movement, the principal organizing force, former president of the United Nations General Assembly, Fr. Miguel D’Ascoto, Dr. James McIntosh of CEMOTAP, Prof. James Small, former congresswoman Cynthia McKinney, who courageously just returned from a factfinding tour of Libya and assessed the destruction in human terms, ‘Attorney at War’ Malik Zulu Shabazz, national chairman of the New Black Panther Party and special guest Minister Louis Farrakhan! The principal focus of the rally will be to condemn in strong united terms the U.S. government/NATO bombing raids on Libya. One of Africa’s most politically and economically independent nations, Libya has done more to help development efforts on the continent than any other nation on the continent and more than any other nations of the former colonial northern hemisphere. Libya has been exemplary in using its natural resources to improve the living standards of its population. Libya has been one of the most driving forces of the Pan Afrikan ideal in practice on the Afrikan continent in recent years. As many Northern African states with overwhelming Islamic majority populations are facing unprecendented internal democratic challenges, serious observers believe that Libya has come under attack to discourage those nations from regrouping drawing from the Libyan example of internal, PanAfrikan continental and Islamic international development and solidarity. The gathering will also condemn the ongoing sanctions against Zimbabwe. Since the Zimbabwean government decided to take back their land from individually wealthy white landowners tied to the former colonial order, Zimbabwe has faced sanctions from the United States and Britain, their former colonial master, in an effort to derail an independent internal development strategy. Millions of foreign dollars have been pumped into the country, openly and covertly, to government opposition forces hoping to ‘de-elect’ the Mugabe. “Long gone are the days of the white man dictating to our people who our leaders are and how we shall govern our own affairs,” exclaimed Zayid Muhammad, the Party’s national minister of culture. “Somebody needs to brief Hillary Clinton and that neocolonial overseer in the White House,” he finished angrily. The rally will also address scores of other anti-war and anti-imperialist themes relating them to devastating local austerity policies. Privatization of public labor, outsourcing, attacks on the right to collective bargaining, cutting funding for education, child care and key support services for the poor while major banks and corporations are receiving huge tax breaks and bailouts, an escalation of police brutality, how all of this can be directly related to the costs of war abroad will be highlighted. 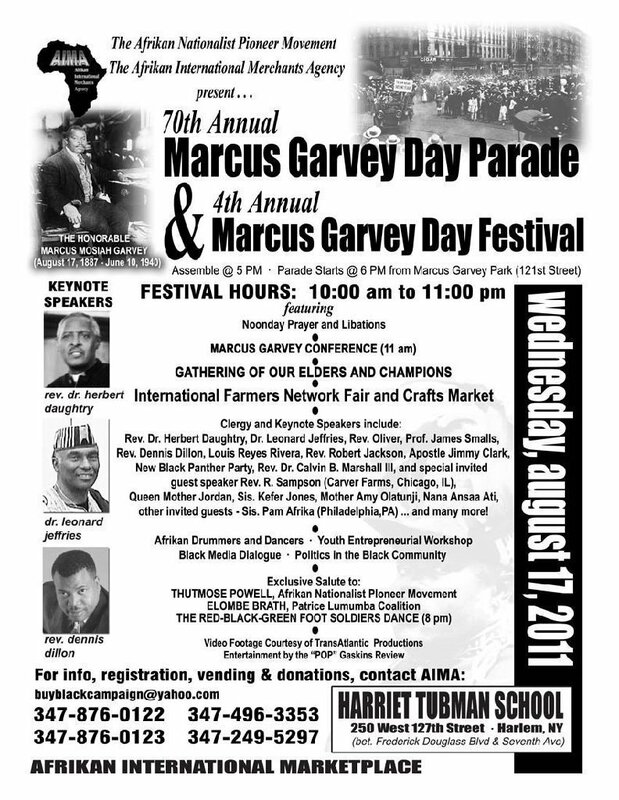 Participants will assemble at Malcolm X Blvd and 110th Street in Harlem at 10am. Get more and similar articles on TheBlackList Pub. It will take place at 12 noon at the Lincoln Memorial, located at the Springfield Avenue and West MarketStreet intersection, Newark. The press conference will take place on ‘the Campaign’s 46th consecutive day! The Campaign was launched on June 27th to dramatize the impact of draconian public policies on ordinary people. POP vows to host this daily action everyday for 381 days in honor of the epic Montgomery Bus Boycott that propelled a young Martin Luther King Jr. onto national consciousness! Among the issues the Campaign is addressing are a need for a national jobs program, a call to end military actions in Iraq, Afghanistan and Libya, a call to stand against police brutality, a call to preserve workers rights and collective bargaining, a call for a moratorium on foreclosures, a call for national health care and for affordable higher education, and more. The press conference will spotlight the issues driving the action and will call for the endorsement, support and participation from other organizations, institutions and leaders. The Peoples Daily Campaign emerges in the aftermath of POP mobilizing nearly a thousand people from laborunions, social justice organizations, churches and other activists this past April 4th to mark the anniversary of the assassination of Martin Luther King! “It’s time to grow this campaign and change the political climate in this city and in this area,” insisted Lawrence Hamm, POP’s longtime chairman. “If these policies are making poverty and pain and suffering grow, then the resistance to those policies must also grow,” he finished. The daily actions take place Monday through Friday at 4:30p.m. at West Market Street and SpringfieldAvenue, near the Lincoln Monument. Saturdays at Broad and Market at 12 noon and Sundays back at the West Market Street and Springfield Avenue location at 2pm. 212-841-O899 (Henry Grimes), http://www.henrygrimes.com, grimestimes@earthlink.net http://www.blackriverdancestudios.com, jesinta1@msn.com. The Argentinian saxophonist ROBERTO PETTINATO, our featured artist here, is a surprise to the world of jazz. He has long been a major celebrity in Argentina, nationally known there as a music critic, writer, humorist, agent provocateur, and TV and radio host, but not at all as an "avant-garde" jazz musician, and his power and originality in this music cannot be explained. As a youngster growing up in Argentina, 5,OOO miles away from the U.S., Roberto fell in love with the recordings of our revolutionary jazz heroes from the '6Os and thereafter. But back in the '8Os, instead of attempting to play that music, Roberto began playing saxophone in Sumo, a cult band in the local rock scene, and during the early '9Os with Pachuco Cadaver, another cult band in Spain. Amidst all his other activities during the last decade, Mr. Pettinato has recorded a few solo albums (such as the notable "Anticomercial" in 2OO3), and he has performed live with pop bands such as Divididos and Las Pelotas. But earlier this year, Mr. Pettinato finally fulfilled his dream of playing the music of his passion in New York City, and he recorded here with Henry Grimes (one of his all-time music heroes) and young Tyshawn Sorey. And now, for the first time ever, Roberto Pettinato is playing a jazz concert here in New York City, in the Village of Harlem. As Mr. Pettinato recently explained in an interview for 10musica.com, "The recording we made in February is a true free jazz album, absolutely free of preconceptions or issues or anything to hold onto. The freedom is the truth. There is no other way to say it. It is the Plain Truth, without religions, in the realm of the Hereafter, outer space, and infinity. From now on, I'll just do this music, and I will defend it to the death." In the late '5Os and throughout the '6Os, after receiving his music education at the Mastbaum School in Philadelphia and at the Juilliard School in New York City, HENRY GRIMES played acoustic bass with many master jazz musicians of that era, including Albert Ayler, Don Cherry, Benny Goodman, Coleman Hawkins, Roy Haynes, Steve Lacy, Charles Mingus, Gerry Mulligan, Sonny Rollins, Pharoah Sanders, Archie Shepp, Cecil Taylor, and McCoy Tyner. Sadly, a trip to the West Coast to work with Al Jarreau and Jon Hendricks went awry, leaving Henry in downtown Los Angeles at the end of the '6Os with a broken bass he couldn't pay to repair, so he sold it for a small sum and faded away from the music world. He was discovered there by a Georgia social worker and fan in 2OO2 and was given a bass by William Parker, and after only a few weeks of ferocious woodshedding, Henry emerged from his little room to begin playing concerts around Los Angeles, and made a triumphant return to New York City in May, 'O3 to play in the Vision Festival. Since then, Henry Grimes has played nearly 45O concerts (including many festivals), touring throughout the U.S., Canada, Europe, and the Far East, playing and recording with many of this decade's music heroes, such as Rashied Ali, Marshall Allen, Fred Anderson, Marilyn Crispell, Andrew Cyrille, Bill Dixon, Dave Douglas, Edward "Kidd" Jordan, Roscoe Mitchell, David Murray, Zim Ngqawana, William Parker, Marc Ribot, Wadada Leo Smith, and again, Cecil Taylor. Henry made his professional debut on a second instrument (the violin) at the age of 7O, has seen the publication of the first volume of his poetry, "Signs Along the Road," and creates illustrations to accompany his new recordings and publications. He has received many honors in recent years, including four Meet the Composer grants and a grant from the Acadia Foundation. He has also held a number of recent residencies and offered workshops and master classes on major campuses, including Berklee College of Music, Buffalo Academy, CalArts, Hamilton College of Performing Arts, Humber College, Mills College, New England Conservatory, the University of Gloucestershire at Cheltenham, the University of Michigan at Ann Arbor, and several more. Henry can be heard on 85 recordings, including a dozen recent ones, on various labels (Atlantic, Ayler Records, Blue Note, Columbia, ESP-Disk, ILK Music, Impulse!, JazzNewYork Productions, Pi Recordings, Porter Records, Prestige, Riverside, Verve, etc.). He has been a permanent resident of New York City since 2OO3. http://www.henrygrimes.com. After majoring in music at the University of Hawaii and graduating from the Berklee College of Music in Boston in 1965, with degrees in composition / arranging and performance, pianist DAVE BURRELL moved to New York City, quickly establishing himself as a most innovative and original musician, collaborating with emerging leaders in the revolutionary avant-jazz music of the '6Os, and joining the groups of saxophonists Marion Brown, Pharoah Sanders, and Archie Shepp. A pianist of singular stature, Dave's dynamic compositions, with deep blues and gospel roots, recall the tradition of Edward Kennedy "Duke" Ellington, James P. Johnson, and Jelly Roll Morton, as well as "avant-garde" composers such as John Coltrane and Thelonious Monk. Mr. Burrell has written an original film score for Oscar Micheaux's 1925 silent film "Body and Soul," music for jazz opera, dance drama, radio and television features, and more. As Musician-In-Residence at the Rosenbach Museum and Library in Philadelphia, Dave was commissioned to write music for "Look Again: African-American History is American History" in 2OO7, and his second commission at the Rosenbach, "Syllables of the Poetry of Marianne Moore" in duet with bassist Michael Formanek, had its premiere in 2OO8. His third commission at the museum, "Western Extension of the United States of America (1811 - Astoria)," was premiered in duo with bassist Michael Formanek in 2OO9. Recently, Dave Burrell has been touring the world solo, in duo with singer Leena Conquest, and with Archie Shepp and William Parker in various settings. During the last 3O years, Dave Burrell has appeared on over 115 stellar recordings, 3O under his own name, and on those of Marion Brown, Grachan Moncur III, David Murray, Sunny Murray, William Parker, Pharoah Sanders, Archie Shepp, and many more. A frequent lecturer, Dave has given master classes at Bard College, Brandeis University, Bryn Mawr College, Columbia University, Conservatoire Municipal, DePauw University, Duquesne University School of Music, Guildhall School of Music and Dance, the Library of Congress, New York University, Queens College, Rice University, Strasbourg Conservatory, Swarthmore College, Tremblay Conservatory, and the University of Pennsylvania. Recent commissions have come from the Rosenbach Museum and Library in Philadelphia and the Whitney Museum in New York City. Dave Burrell is the recipient of numerous grants and awards from the William J. Cooper Foundation, John Garcia Gensel Award, MidAtlantic Foundation, National Endowment for the Arts, New York State Council on the Arts, Pennsylvania State Council on the Arts, Pew Fellowship in Jazz Composition, and the Philadelphia Music Foundation. http://www.daveburrell.com. TYSHAWN SOREY, born in Newark, NJ in 198O, is a very active young composer, multi-instrumentalist, educator, and scholar who works across an extensive range of musical idioms. He began making music on a toy drum set when he was three years old, branched out to piano at age five, followed up with trombone, and was his own self-taught one-man band by the time he was 8. After high school, he studied jazz and performance at William Paterson University. He has performed and / or recorded nationally and internationally with several of his own leader ensembles, as well as groups led by Muhal Richard Abrams, Billy Bang, Anthony Braxton, Steve Coleman, Dave Douglas, Henry Grimes, Vijay Iyer, Steve Lehman, Lawrence "Butch" Morris, Matana Roberts, Michelle Rosewoman, Wadada Leo Smith, and many more. Tyshawn Sorey's recent music has focused on concepts derived from the music of Morton Feldman and Zen Buddhism, using these models for interpreting determinate music, acting as principal generators for the discovery of ideas. Mr. Sorey has conducted and participated in various lectures and master classes on improvisation, composition, contemporary drumming, ensemble playing, and critical theory at Berklee College of Music in Boston, Birmingham Conservatory of Music in the U.K., Cite de la Musique in Paris, Conservatorium van Amsterdam in the Netherlands, Hochschule Fur Musik Koln in Germany, International Realtime Music Symposium in Norway, Musikhochschule Nurnberg in Germany, and the School for Improvisational Music in Brooklyn. Tyshawn is currently a private instructor in composition, critical theory, and improvisation for the School of Improvisational Music and the New School for Jazz and Contemporary Music. He recently earned his Master's Degree at Wesleyan University, studying with Anthony Braxton. Tyshawn Sorey's music can be heard on the 482 Music, Clean Feed, Firehouse 12, and Pi labels. http://www.tyshawnsorey.net.